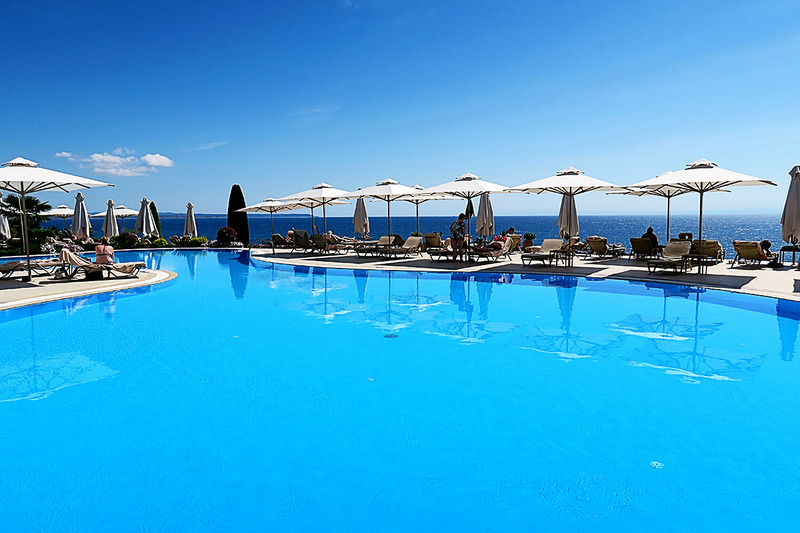 Sitting on my sun lounger, a mojito in one hand and my book in the other, I stared blissfully out at the clear blue of the infinity pool and beyond that to the sparkling waters of the Mediterranean Sea in the background. If I squinted hard enough I could almost imagine my three favourite people there in the pool, splashing around in excitement. Mads would be giggling and squealing, like she always does when she is happy, and LL would be floating around gripping on to her Daddy’s shoulders. 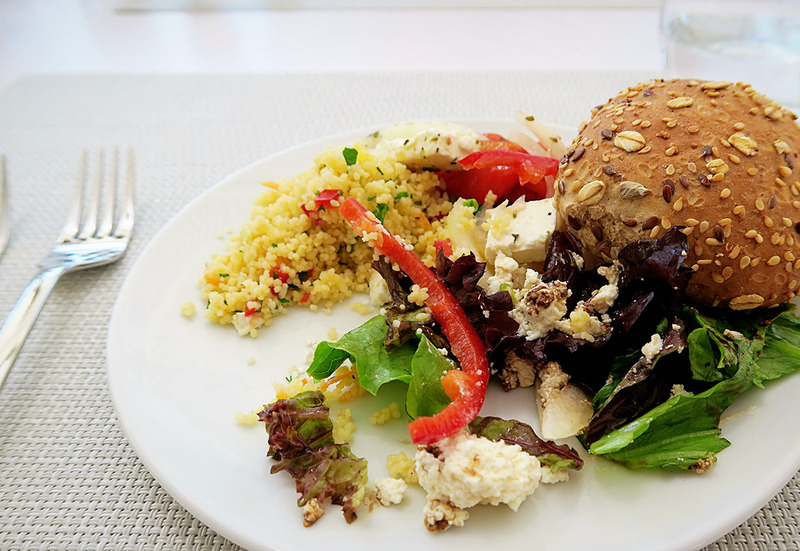 I know for a fact that my little family would absolutely love it at Ikos Oceania. But this time it was just me there and although of course I missed them terribly, I was loving having a chance to relax and to think about things. 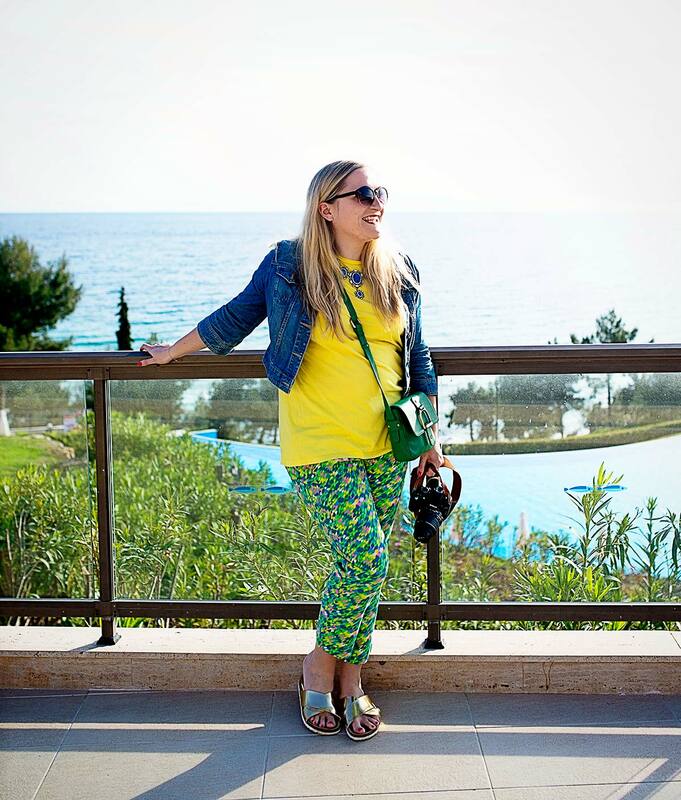 The reason for my short trip was that I was invited away for a lovely few days in Greece with Ikos Resorts and Sovereign Travel. I always feel incredibly lucky to be able to have a chance to do these things and this trip was no exception. We were a small group of seven, made up of travel journalists, bloggers and the PR representives and it was great to have a chance to make new friends and experience such a beautiful resort. 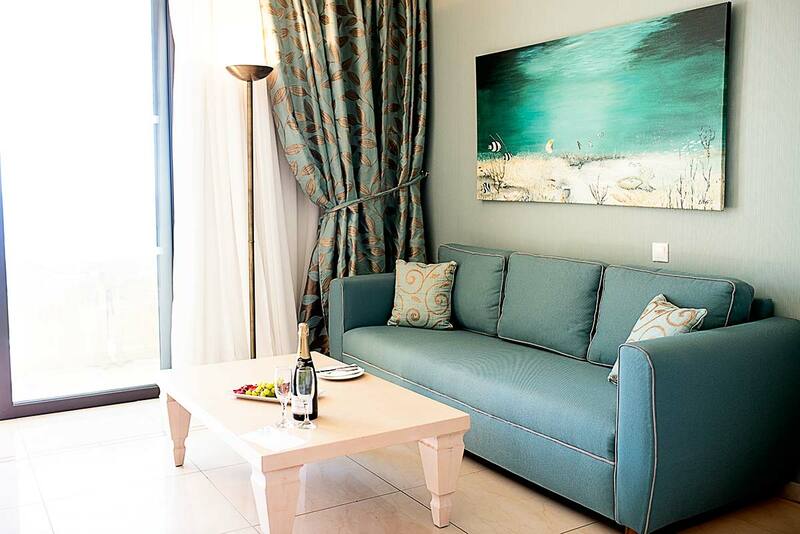 Ikos Resorts have two properties, the property that we stayed at Ikos Oceania which has recently undergone a €4 million refurbishment, including new family rooms and a completely renovated kids club. Also in the group, is the brand new Ikos Olivia, which actually only opened this week (May 2015) and which I was honoured to be able to have a sneaky peek at a few days before their launch- it looks absolutely stunning and I am definitely going to try and go back with my little family soon. After our super early three hour flight from Gatwick (local airport is Thessaloniki and then it’s about a 20 minute transfer to the resort- if you book with Sovereign Travel you get a lovely private transfer) we arrived at Ikos Oceania and were ushered into the beautiful adults bar to check in with a nice cold glass of champagne. This was the view that awaited us. 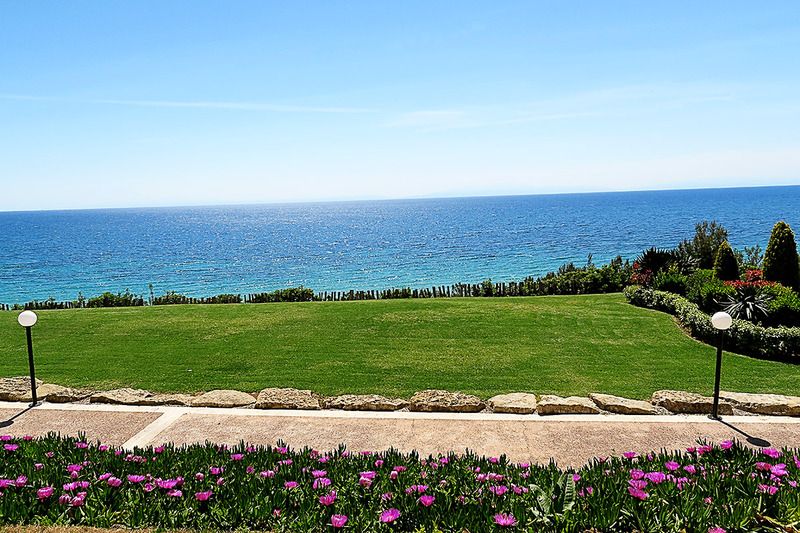 Oceania is nestled into the hilltops, with spectacular views of the Mediterranean. There’s a private beach, plus a number of different pools including one especially for little people. After check in we made our way to our rooms and I certainly wasn’t disappointed. 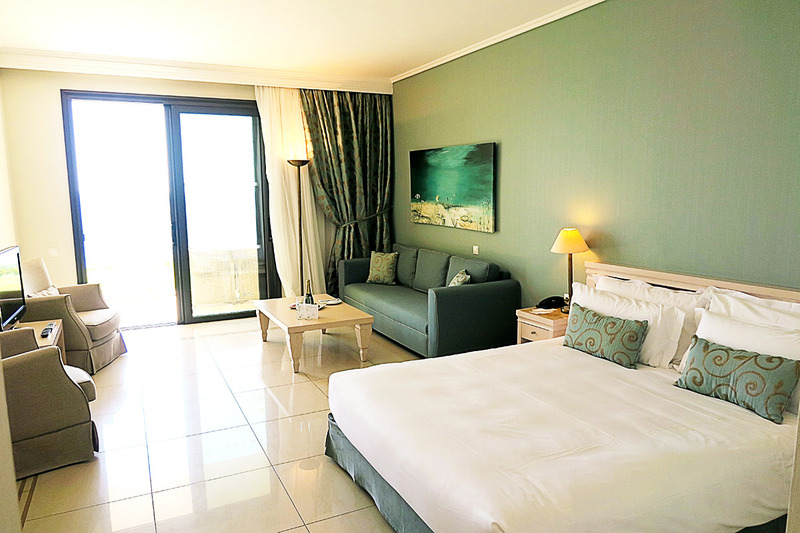 My Deluxe Junior Suite was styled beautifully, with a calming blue and green colour scheme and a huge terrace over looking the sea. There are a number of different room types so there really is something for everyone, but one of the main things I look for in a holiday as our girls are so little, is an area where they can sleep, knowing that even if they go to bed at 8pm there is somewhere we can sit and chill out. 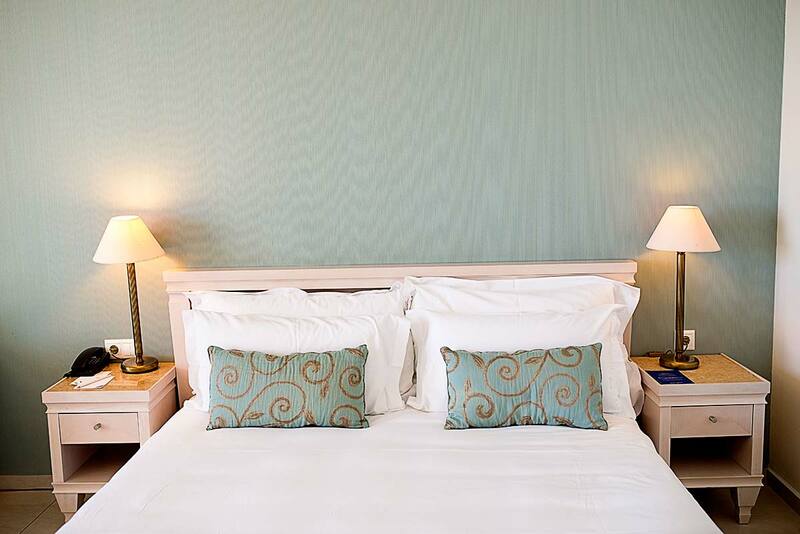 Ikos Oceania has a number of different room types depending on your family make up- and all have been refurbished along the same sort of colour scheme and decor style. The view from my terrace was absolutely stunning. In fact one thing that I really noticed about the resort was the attention to detail when it came to the grounds. There was lush green grass, beautiful colourful flowers, and shrubs everywhere. They really obviously have invested a lot of money in making sure the gardens look perfect. Before we slept in the beds for the first time, we were laughing with the hotel marketing manager about the fact that the pillows were so comfy people wanted to buy them. We were unconvinced but indeed the pillows are probably the comfiest I have ever slept on- she was definitely right! 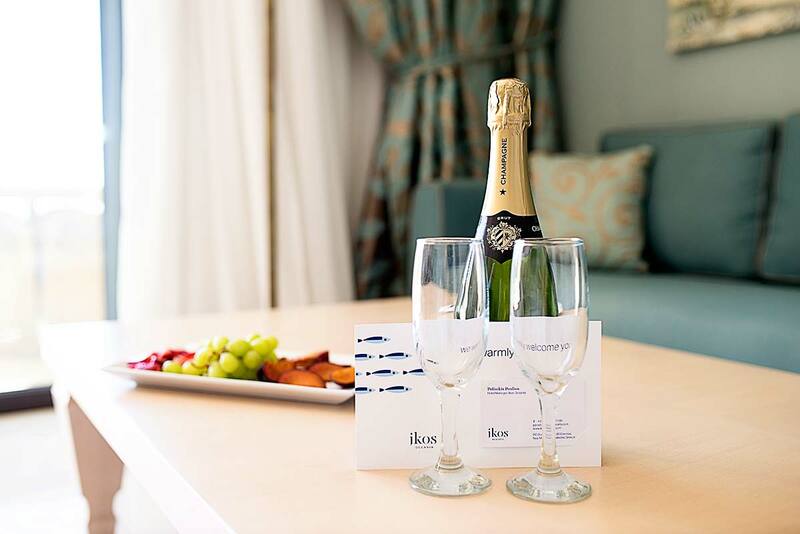 The champagne and fruit on arrival were a really nice touch. 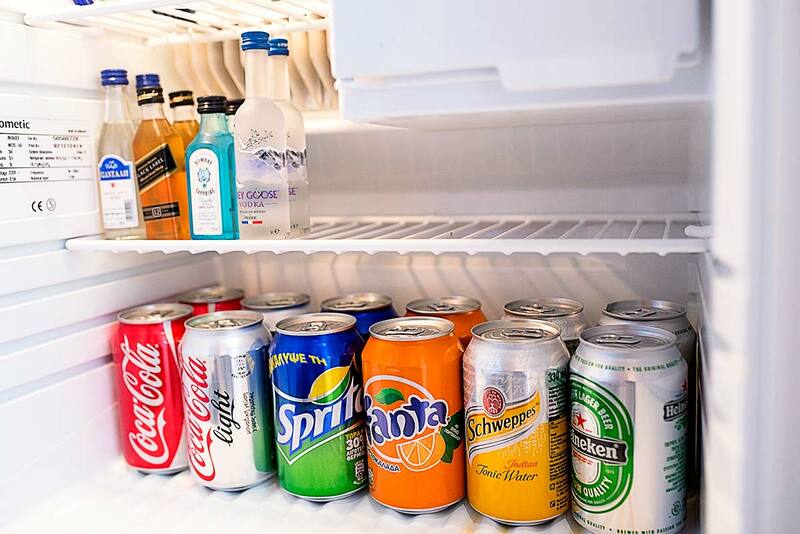 The resort is all inclusive but has coined the term ‘infinite lifestyle’ – it’s got those little extras such as four a la carte restaurants, a dine out service, and high end premium drinks brands that make this a cut above the rest. 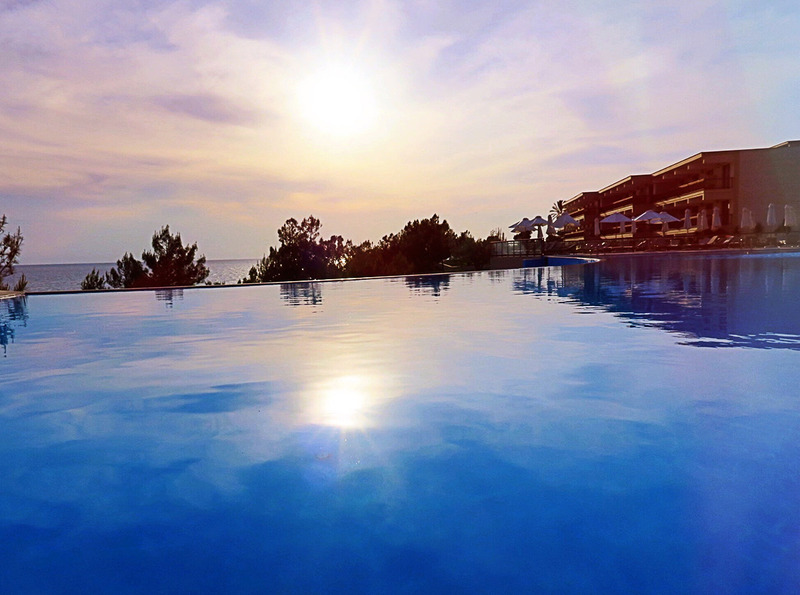 Indeed Trip Advisor voted it the No 1 All Inclusive in Europe and you can certainly see why. We headed off to the Ouzo Restaurant for lunch on our first day- a gorgeous light and bright restaurant situated by the main pool. Without a shadow of a doubt the food at Ikos Oceania was some of the best I have eaten for a long time, it’s hard to believe it’s an All Inclusive resort and that it’s all included in the price. We were treated to plates upon plates of delicious food, and my jeans were definitely a little tight by the end of the trip. 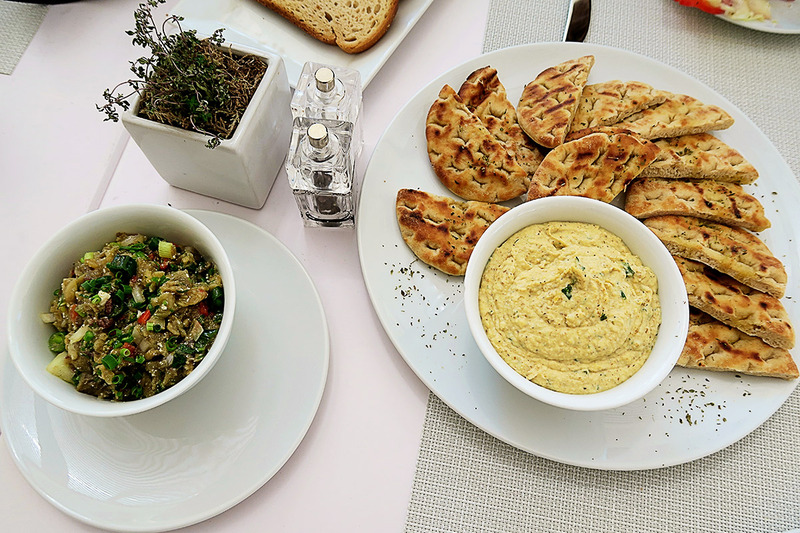 Think warm pitta breads, homemade houmous, and fresh and light salads. Greek food is one of my favourites, but I honestly was in heaven here. It’s a pleasure finding out that one of your great friends is on the same trip. It was fantastic spending time with Alison, my fellow Space In Your Case buddy. Here we are doing what bloggers do best and posing before going out for dinner. On our first evening before dinner we were joined by the marketing manager and were kindly given a tour of the hotel- it was great to be shown round and see exactly what they had to offer. How beautiful is this pool? It really was stunning. It’s the little extras that make a real difference to your holiday, and I absolutely loved the all day waiter service at all of the pools and the beach. 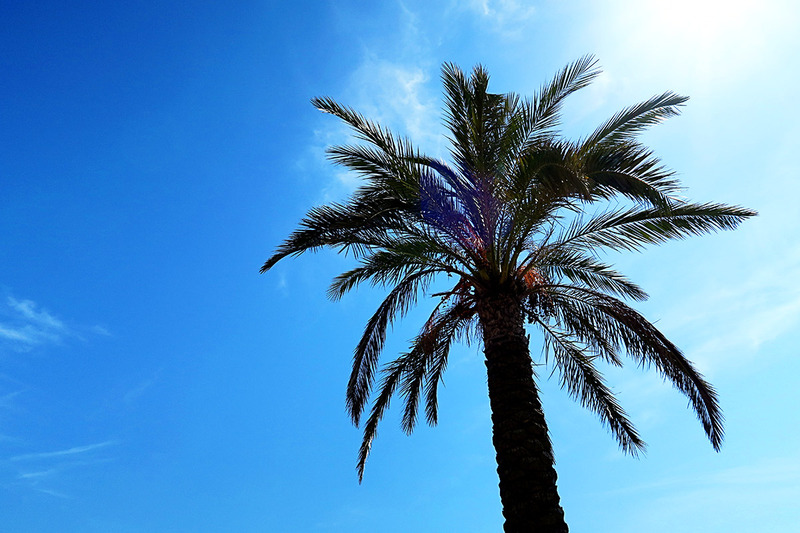 Beautiful palm trees dotted around the resort. The hotel is on it’s own stretch of private beach, perfect for little one’s who like to take a bucket and spade. One great little extra is that the resort offers a 30 minute childcare service on the beach- you can drop your child there and let them have fun, while you do important things like get a cocktail or enjoy a spot of sun bathing. It’s all included in the price too of course. We got a chance to check out the Kids club and I was blown away by the facilities they had on offer- it was spotlessly clean, with so many lovely toys. 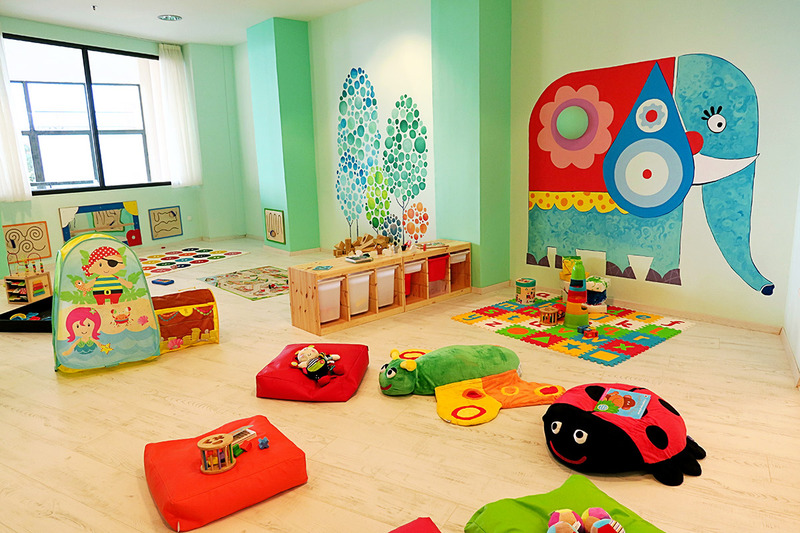 The childcare is included in the price of your stay if you chose to pop your kids in the club for a few hours, and is run by Worldwide Kids Company, a UK based childcare provider. This provides reassurance to parents that your kids are in the best possible hands. Indeed this is just one of the rooms, there are two others depending on the age of your little person and they have a huge program of activities available for them. All these things are so welcome for parents of young children, as we know that sometimes holiday’s can be a little bit tiring when you are constantly watching their every move. It’s nice to have the option even if you don’t end up using it. 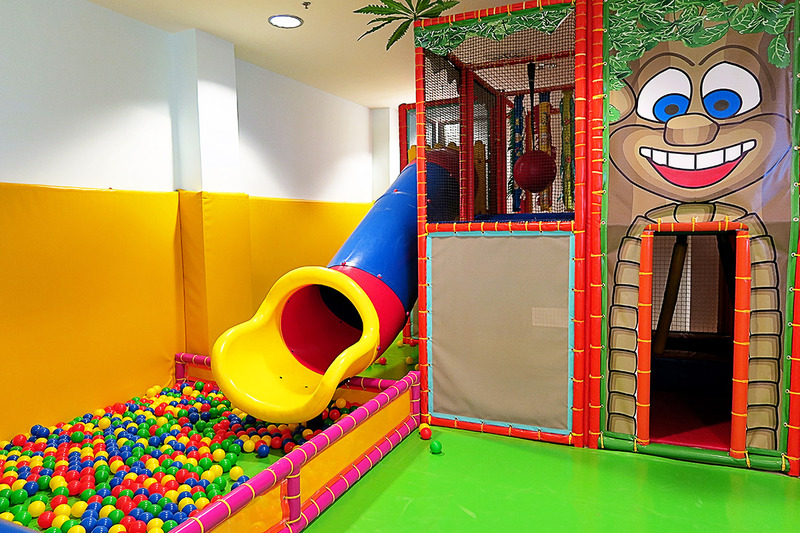 How amazing is this soft play? I know my girl’s would have loved it and Mads indeed saw my photos the other day and said ‘I want to go there to play Mummy’. For our evening meal on Friday night we again dined at the Ouzo restaurant, where we were served a number of delicious taster dishes. 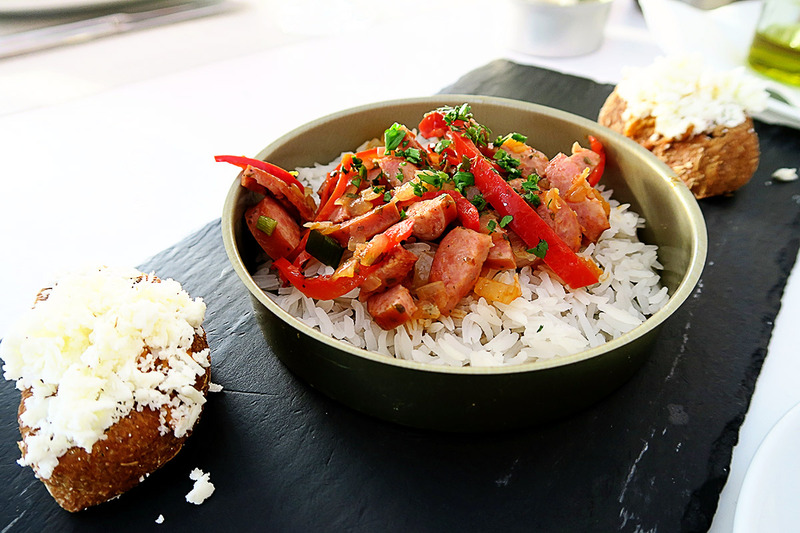 Like this Greek Sausage dish. 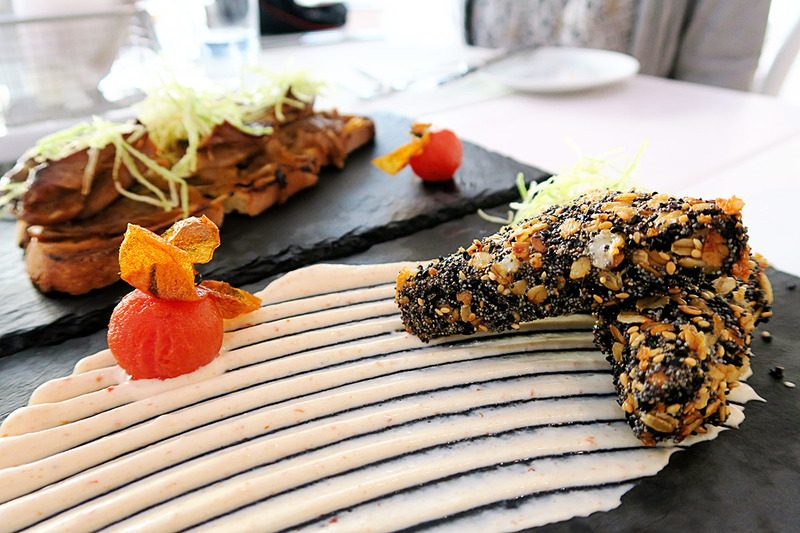 Michelin Starred chef Lefteris Lazarou’s a la carte menu is Greek with a modern twist. This sesame bread stuffed with cheese was delicious. 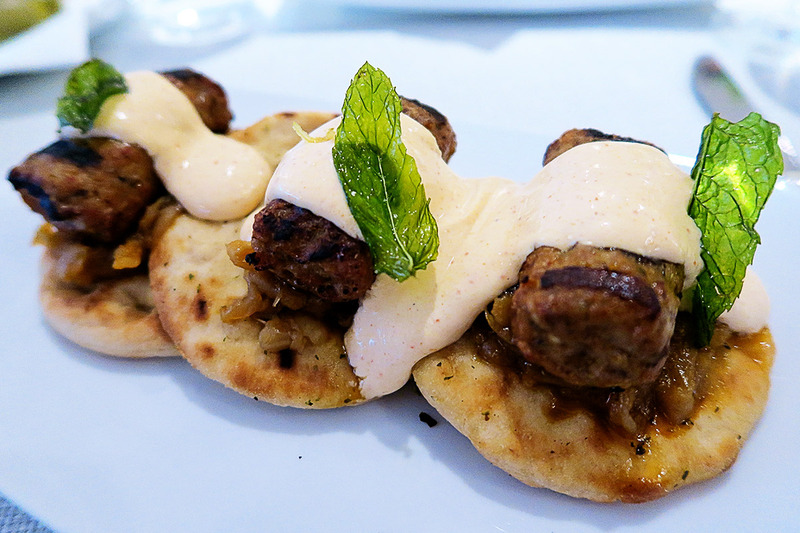 Mini lamb kebabs with a lightly spiced yoghurt sauce on Pitta Bread = Best Thing Ever! I need to take Mads back to Ikos Oceania just so she can have this dessert- no one was 100% sure what it was as they just bought it out for us, but basically it was warm Nutella with something which resembled cornflakes, mixed together with ice cream- it honestly was one of the tastiest puddings I have had in so long. My little Nutella addict would have loved it! Our meal at Ouzo was delicious, topped off with a drink similar to Ouzo (yuck!) and some lovely wine from the resort’s extensive wine list. The sun setting on the main pool and my view from the restaurant. It definitely was a fantastic first day and I went to bed feeling thoroughly full, with a voice hoarse from chatting and laughing with new found friends. Here is a little video from my time at Ikos Oceania- next part of our trip coming soon! 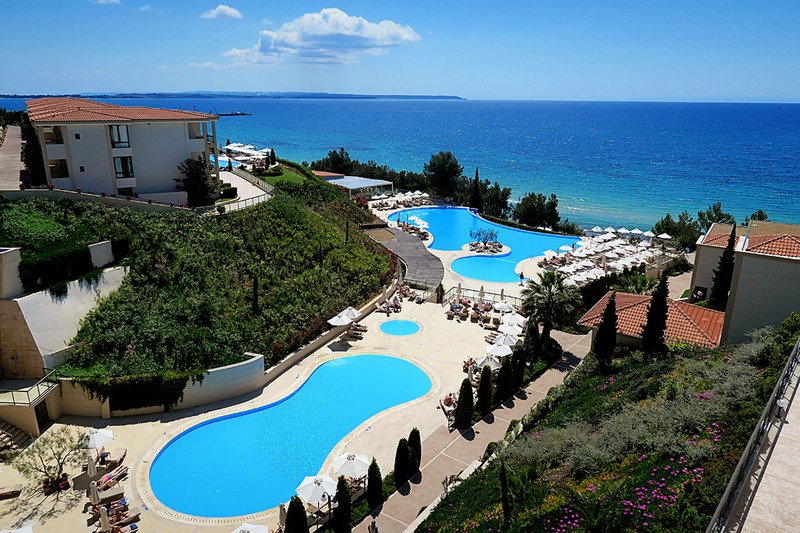 Sovereign (01293 731566, www.sovereign.com), the luxury specialist, has a week at Ikos Oceania from £1899 for a family of three on an all-inclusive basis. 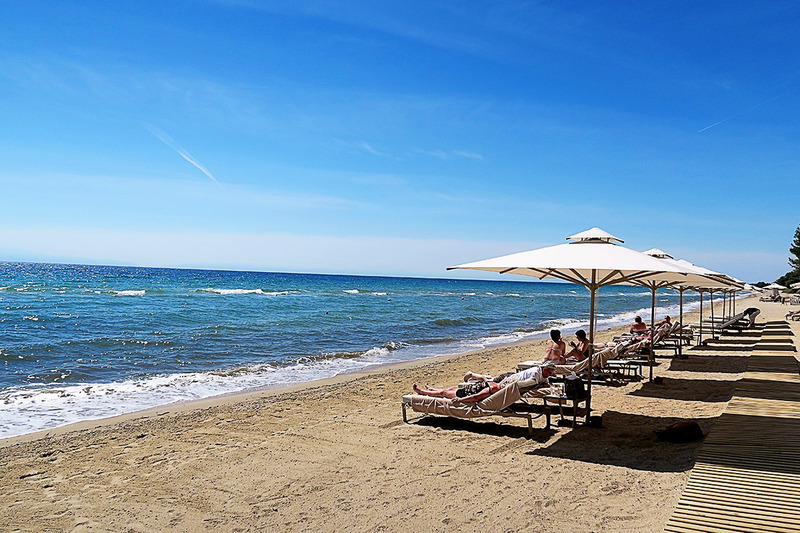 The price includes return flights from London Gatwick to Thessaloniki with easyjet and private resort transfers. All Sovereign customers also benefit from complimentary lounge access at No 1 Traveller Gatwick and the premium security lane, as well as a private cocktail on the beach and a farewell gift. Price based on departures 25 October 2015 with a saving of £411 per family. Wow, Katie, that looks amazing. The food must have been incredible! Wow! Just wow! It looks gorgeous, and all that deep blue sunshine after yesterday when it poured with rain here and was damp and chilly and miserable is just too tempting! Lucky you for getting to go and explore! Oh and when Kitty saw the soft play her reaction was exactly the same as Mads!! Stunning – I’m off to Greece in two weeks (not quite as plush as this) but you’ve just got me so excited! Have an amazing time Alice! The hotel and food looks lush, I want to go right now! haha. Oh Katie you make me want to go there right this minute. Wow. Your videos are truly the best I have ever seen darling. So creative and flow perfectly I have so MUCH to learn editing and recording. True inspiration right here. What a beautiful part of the world and so lucky to happen to be there with Ali. That’s awesome. Bet it made the trip that much better. Girlie time away in such a beautiful place. I was blown away by the creche would consider putting my kids there for sure. Might have to make note of this for future holidays. lol Gorgeous post as ever. It looks so stunning – kind of simple and elegant? Greece is definitely on my list with the family at some point and this looks perfect for younger families. Wow, lucky girl, it looks amazing. The kid’s club looks great. Wow! Just wow. How amazing does this place look? That pool is just he perfect shade of blue. The sky too! I’m on the look out for potential honeymoon locations and this could well be a contender. It’s not quite the Maldives (which is the dream!) but that kids club is certainly a selling point. P.S. I love your trousers! This is a great post and I love all of your photos. 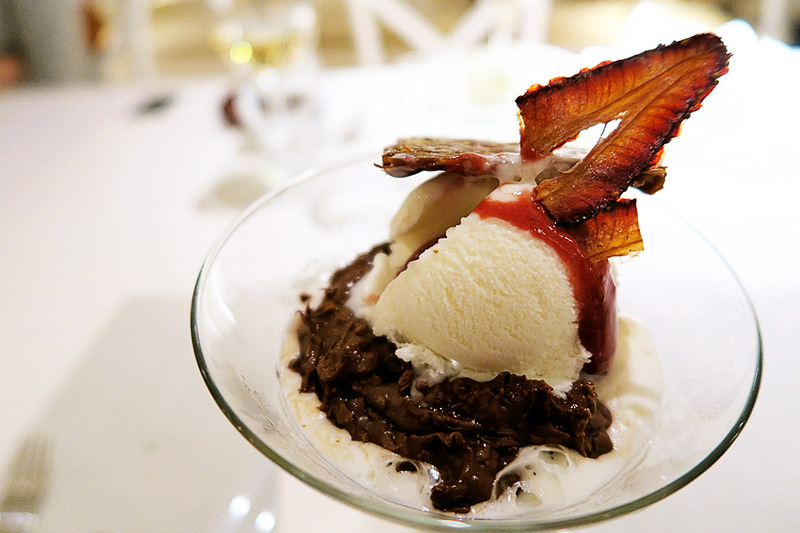 It was a lovely trip and I agree with you about that Nutella dessert – if only we had the recipe! Oh wow, this looks fantastic, that first picture is stunning.